May faces a crucial vote next week on her proposed Brexit deal. UK LABOUR LEADER Jeremy Corbyn has called for general election to be held in order to “break the deadlock” around Brexit. Corbyn said that Theresa May’s Conservative minority government “cannot command a majority in the House of Commons” and that an election was needed to break the impasse. May faces a crucial vote next week on her proposed Brexit deal, but is facing an uphill battle to get the deal through parliament, with significant opposition from both within and outside of her party. May already cancelled a vote on the deal before Christmas, after it became apparent she didn’t have the support to get it through. The main sticking point for Brexiteers, within her own party and the DUP, is the provision of a Northern Ireland backstop in the deal. This backstop would avoid a hard border in Ireland but also keep the UK in regulatory alignment with the EU. Without a deal, the UK is set to go crashing out of the EU when the deadline on 29 March is reached. 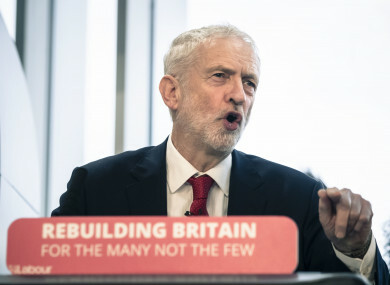 In a speech, Corbyn said that Labour would move a motion of no confidence in May and the government when they judged “the best chance of their being success when we do that”. “Clearly, Labour does not have enough MPs in parliament to win a confidence vote on its own. So members across the House should vote with us to break the deadlock,” Corbyn said in a speech yesterday. “This political chaos cannot go on. The only way forward, the only way out of it, would be a general election. The people can decide which MPs they want in, which parties they want to be in government and what the priorities of that government would be. Corbyn said that his party had no confidence in the government and that they “honestly believe the best way forward is a general election”. Yesterday, it was reported that May was considering making important concessions to the opposition Labour party to try to secure the support of some of its MPs. Email “'This political chaos cannot go on': Corbyn calls for general election to break Brexit deadlock ”. Feedback on “'This political chaos cannot go on': Corbyn calls for general election to break Brexit deadlock ”.